So back to my point–these gifs are not Da Vincis. In artistic merit, they’re not Picassos or Monets or even Stephanie Meyers–nope, they’re definitely better than that. Sorry, Team Mayers folks. It must be said. Because I drool over them anyway. This may or may not have physically happened to me in the middle of, erm, lecture last week when I was staring at them. It’s okay, nobody noticed. Also, if you haven’t already seen the gif-spirational sensation Izy over at Top with Cinnamon, you probably want to pop on over there. Give credit where credit’s due, I always say! She’s a gif-nius. So. To wrap it up, since I’m out of writing space (and frankly, I have a pile of papers waiting here to be graded). Students asked me for this recipe. Fellow TA’s asked me for this recipe. Kind of like you’ll probably want to eat these gifs and photos off the screen right now. Don’t. It’ll ruin your screen. I’d advise running to your oven RIGHT NOW instead. Preheat oven to 350 degrees F. Lightly grease a 9×9-inch baking pan and set aside. In a large mixing bowl, combine graham cracker crumbs, melted butter, white sugar, and 1.5 teaspoons cinnamon until mixture is completely moistened. Press lightly but evenly into bottom of prepared pan. In a large mixing bowl, combine sweetened condensed milk, pumpkin, 1 teaspoon cinnamon, nutmeg, and ginger. Pour evenly over the graham cracker crust. Sprinkle apples, coconut, white chocolate chips, and streusel over the top of the mixture; press ingredients lightly into the top so that they stick. Bake in preheated oven 32-37 minutes, until center is mostly but not completely set. (If it’s still gooey, that’s perfectly fine–it will firm up a bit in the freezer). Allow to cool slightly at room temperature, then pop the batch into the freezer for 30 minutes for easier cutting. Cut into bars; store leftovers in freezer. 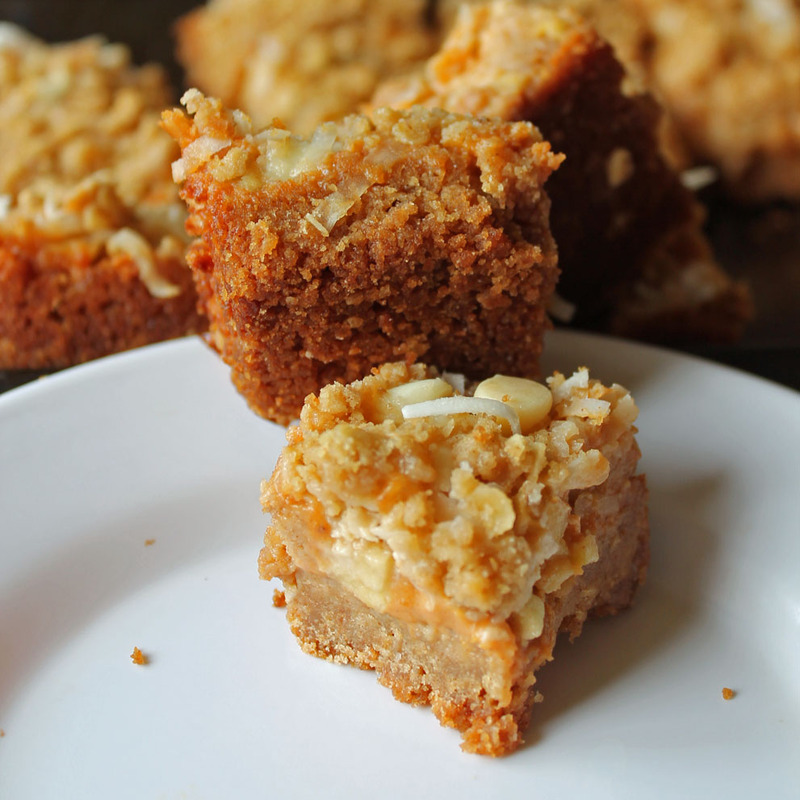 NOTE: Alternatively, you can bake these bars 3-5 minutes longer than the listed baking time. This will result in bars that can be stored and served at room temperature. In a medium bowl, combine flour, brown sugar, cinnamon, and salt. Cut in butter and rub through with your fingers until the mixture resembles a coarse meal. 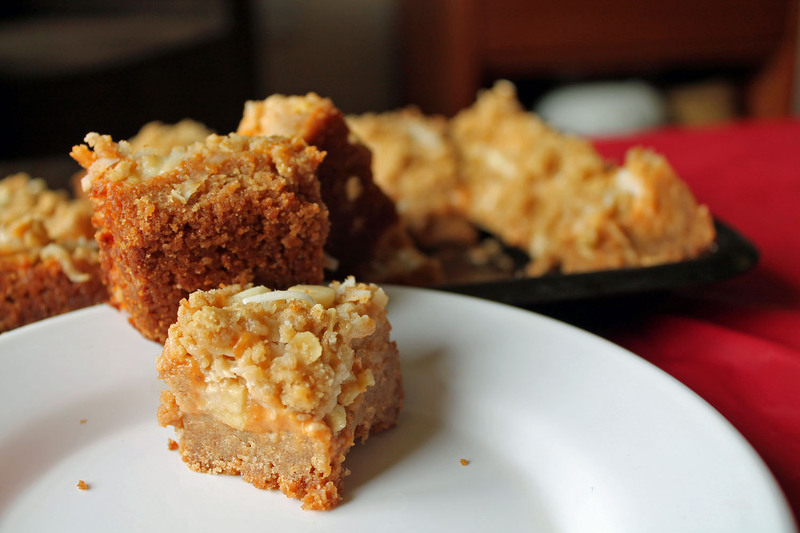 Use as streusel topping for pumpkin magic bars, muffins, breads, or anything you’d like! I have leftover streusel topping and 2 1 cup containers of pumpkin puree in my freezer … sounds like it was meant to be. 🙂 It looks very good. If we’re talking about fate, the stars are currently bemoaning the fact that they wasted time on Romeo and Juliet–this is *definitely* fate! Thanks for stopping by–keep me posted on how it turns out! I’ve been cooking all week and need to take a break this weekend but it’s definitely on my to try list on a leisurely weekend. Just made tamales today, a 2 day process, and I’m beat. Wow, I’d love to hear how that goes–thanks for stopping by, Caitlin! Great looking bars! And the gifs are always way cool. Best of all, I don’t go to class, so I can drool all I want as I look at them! 😉 Good stuff – thanks. And I’m extremely jealous of the fact! But I’m glad you enjoy the gifs, too. Thanks for stopping by, John! These look SO good. I am SO making them next time I’m craving Fall. Pinned! Oh, they’re scrumptious–thanks so much, Dorothy! This comment made my day. Awesome recipe! I’m no baking whiz so maybe I can ask someone to make them for me, heh. Although if I may ask, why doesn’t Windows Movie Maker work for you? Oh, and is it possible for you to put your posts under a Read More link? Or at least, a spoiler link (using the Advanced Spoiler WordPress plugin). The gifs look great but they’re heavy, so they make loading your website a lot slower. By hiding them under a Read More link (like the LJ cut), the gifs won’t have to load all at once and bog up your site’s speed. Wow! Thank you for the absolutely stellar advice and tips–this was so fantastically helpful. I’ll be sorting through those sites and playing with them now, so I hope you’ll check back and see the gifs improve 😉 you’re fabulous! Windows Media doesn’t work because 1) I’m technologically impaired, and 2) I suspect because I may not have enough memory to run the program or something is incompatible–those seem to be the top 2 reasons on the help sites. Short answer: I’m not sure! I considered (and may still consider) using the read more tab, but since my personal preference for other sites is to read them all in my reader, I’m going to delay that for a bit. I do appreciate the input though! Please do keep it coming–it’s just a personal preference in this case. I hope you get these as a treat–you deserve them!! I’d send you some myself if they’d keep en route 😉 great seeing you around! If you’re in LA like I am, Amy (which I think you said you are! ), then I totally know what you mean–summer is definitely outside my window at this very moment! I hope you do try it–and definitely let me know how it goes. Thanks for stopping by, Amy!